Summit Clear Water Barley Straw is the natural alternative to treat algae in decorative garden and fish ponds. 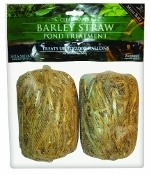 Clear-Water Barley Straw naturally decays in your pond water, releasing enzymes that aid in controlling both single cell and string algae. Determine how many mini bale(s) are required to treat the pond. 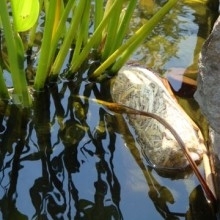 Place the mini bale on the surface of the pond, preferably near a waterfall or filter outlet. Do not allow mini bales to sink to the bottom of the pond. If bale sinks, remove from pond for 24 hours to dry and then put it back into the pond. Allow one month for the mini bale to become effective. Replace each mini bale after 6 months of use. For continuous treatment, after 5 months, place a new bale next to the old one. Then remove the oldest one at the 6th month mark. For best results keep barley straw mini bale floating on the pond year around.